The development of PVD Aluminum Titanium Nitride based coatings is the most significant advancement in wear coatings since the introduction of Titanium Nitride. 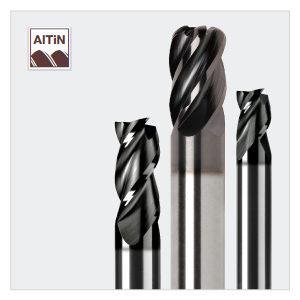 The addition of aluminum to the coating not only increases cold and hot hardness, but also can double the maximum operating temperature of AlTiN coated components. The aluminum in the AlTiN coating converts to aluminum oxide from the heat in these high temperature applications creating a ceramic layer in the coating. The oxidation onset temperature is 900°C, which is one of the highest commercially available oxidation temperatures for a PVD coating. RobbJack’s AlTiN coating has a violet black color and its hardness properties can be tailored by varying the aluminum content of the coating.